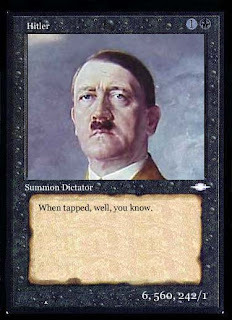 Hitleriffic - More fun than a barrel full of Nazis™: Who's the Hitler? In short, the plain and brutal truth is that if Iran is to be prevented from developing a nuclear arsenal, there is no alternative to the actual use of military force--any more than there was an alternative to force if Hitler was to be stopped in 1938. It's all so confusing. I thought Grenada was Hitler. Or maybe it was Nicaragua, no wait, it was Panama. Nope, it was Somalia. Serbia? Iraq? Funny how Godwin's law never applies to neocons. But at least the neocons are approaching that mythical status called an "opposite indicator." You can be assured that whatever the neocons think should be done is almost certainly 180 degrees from the thing that would work best. The truly disgusting thing is these people have not one ounce of shame or remorse for their already failed policy in Iraq, and they're all set to attack another country. Sick, twisted old men sending the young to die for ideological fantasies.